We collect aluminum cans. This fundraiser generates cash that is used for Post 305 activities. PLEASE save your alumninum cans thru the month and bring them to the meeting each month. Many thanks to Harlen Thornhill for management of this fundraiser. If you would like to support the program with a direct donation, click this Aluminum Can Recycle Fundraing Donation Form link. A huge THANK YOU to everyone who participates. The semi annual Rummage Sale is usually held in April and October. Normally, the rummage sale is the Friday and Saturday after the third Thursday meeting unless noted differently. Donations to the rummage sale are always needed and appreciated. We have volunteers with trucks and trailers to pick up any items you might wish to donate. Also, because we are an IRS approved 501 (c) 19 organization, we can offer a donation receipt that can be used on your tax return as proof of a charitable donation. 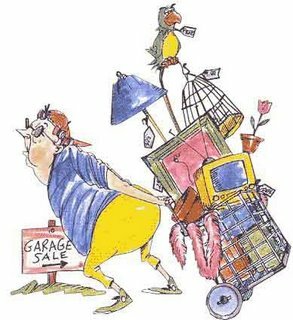 The rummage sale is held at the Robinson Road Communty Center, located at the intersection of Robinson Road and Hannah Road, zip code 77386. Te rummage sale is held on Friday and Saturday 7:00 am to 3:00 pm. Setting it all up: Volunteers normally meet about 7:00 am on Friday, then travel to the storage building as a group, load everything and bring it back to the rummage sale location. If you have a truck, please bring it. If not, don't worry about it... we need volunteers to help load and un load. Click here for a Flyer about the current Rummage Sale.